Today was Day #7 of Chocolate and Poetry Theme Week. 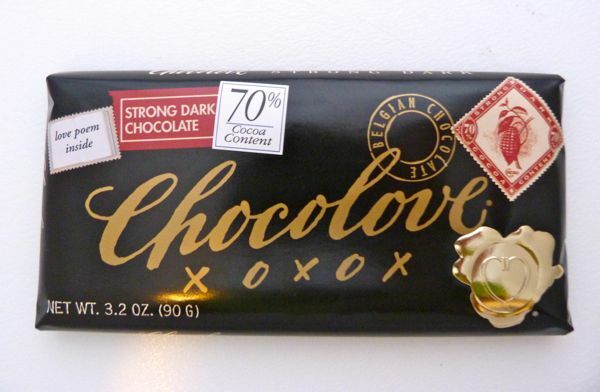 I was reading poetry quotes as I sampled this Chocolove (Boulder, CO) "Strong Dark Chocolate" (70% Cocoa Content) bar. I was trying to select a few pretty words to pair with today's bar. Made from Belgian chocolate, this bar had a strong snap to it. I wondered if I should find a poem from a Belgian poet, or a strong poet? "...'Ay me,' quoth Venus, 'young, and so unkind? If they burn too, I'll quench them with my tears..."
Note: Another few verses from this spicy love poem was printed inside the current (expir. 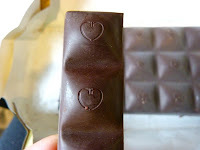 Jan. 2013) wrapper of Chocolove's Ginger Crystallized in Dark Chocolate bar.